Two years in a row we have been willing participants in glorious evenings under the stars at the Greek Theatre in Berkeley, CA. Last year, we watched My Morning Jacket level the amphitheater into a smoldering pile of amp buzz and reverb, and this year Wilco loved us with their mid-western brand of rock 'n roll and we loved them in return. 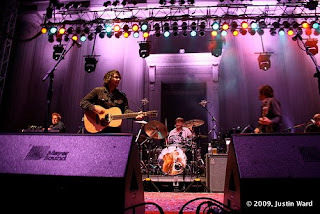 As they have done for much of this tour, the band strode onstage to the theme from The Price is Right before launching into "Wilco (the song)" off their new album. The song being a love-fest between the band and its fans got the show off to a big start and woke up the sun drenched crowd who had been baking in the afternoon sun for much of the past 90 minutes. Songs on record that can be dirge-like sprang to life in the live setting: "At Least That's What You Said" off the A Ghost is Born album was played like it was custom built for an outdoor amphitheater, complete with the crowd erupting at the first blast of Crazy Horse style guitar chords. Guitarist Nels Cline tortured his guitars and amps, sqeezing every last ounce of feedback out of them possible. Songs off the mellow Sky Blue Sky album also benefited from the live setting. 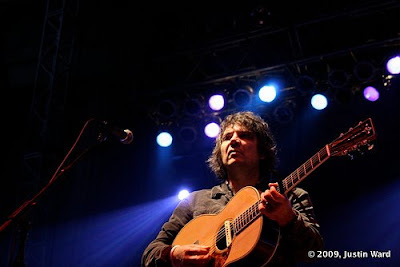 The Floyd-ian "You Are My Face" synced perfectly with the setting sun and "Impossible Germany" allowed one of many guitar duels between Cline and keyboardist/guitarist Pat Sansone and ringleader Jeff Tweedy. Tweedy's vocals sounded superb all night. Clearly enjoying the evening, Tweedy addressed the crowd often, checking on a fan who might have overindulged before the show and even blaming the Bay Area crowd for turning his son into a hippie just as his son walked out on stage in ahead-to-toe tie-dye outfit. The crowd deserves props too. Everyone seemed into it and the balance of songs played by the band seemed to leave something for everyone's tastes. One thing that did leave us scratching our head were the amount of people sitting during the show. Not that this diminished the energy level in the crowd, but it's not often that you see a Saturday night rock show with people seated.